Visitors were welcomed to the Albion Dockyard in Hanover Place, Bristol from 12 noon and a short re-dedication ceremony commenced soon after 2pm with Project Manager Bob Stokes acting as Master of Ceremonies. After speeches by Councillor Faruk Choudhury (the Lord Mayor of Bristol), Marshall Vine (MQPS President), Brian Burton (MQPS Chairman) and David Abels of the Albion Dockyard the traditional bottle of champagne was cracked on the ship’s bow by Evelyn, Emelia, and Elizabeth, daughters of Andrew Summerell (MD Albion Dockyard Ltd.). A gathering of vessels of the Steam Boat Association waiting outside the dry dock then gave a rousing whistle salute which was followed by the National Anthem and a further prolonged whistle salute. The ceremonial party also included Sir William and Lady McAlpine, John and Noreen Chambers (MQPS Vice Presidents), Lucy Perry (representing the Heritage Lottery Fund), John Kempton (MQPS Vice Chairman) and representatives from The Merchant Navy Association. The ceremony was witnessed by over 1000 visitors and guests. The Albion Dockyard band performed beautifully from the fore deck of Medway Queen herself, both before and after the ceremony. The band previously played at nearly all the launches at the Albion Dockyard since 1942, when the yard was operated by Charles Hill and Sons until its merger with the Potterswood Band in 1966. It also performed at a ceremony marking the start of Medway Queen’s rebuild in 2009. The event proved a popular one. 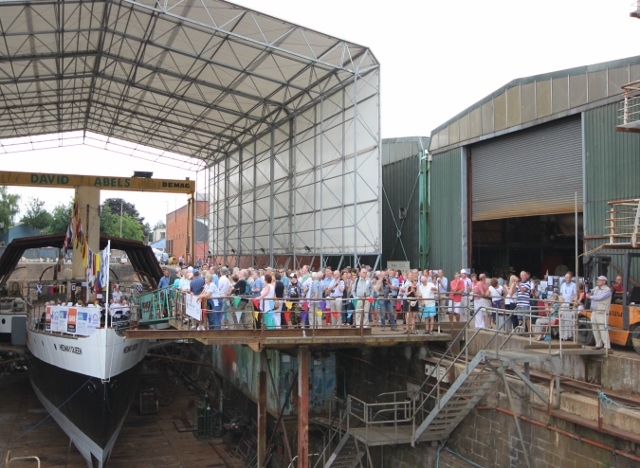 Besides society members who came on a weekend coach trip to Bristol from Gillingham in Kent, enthusiasts from all over the UK and many Bristol residents came to the yard to see the ship pass this milestone in her restoration. Before the ceremony they were able to admire this historic vessel in her pristine new coat of paint and discuss her history with members of the society. 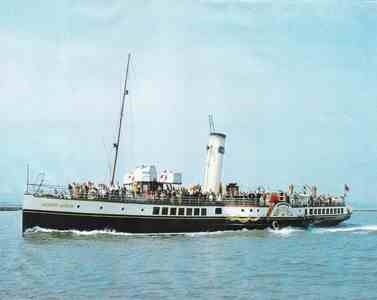 Medway Queen’s story includes seaside excursions, wartime minesweeping and the Dunkirk Evacuation as well as a rather different reputation as a nightclub on the Isle of Wight in the 1960s. Souvenirs, books and draw tickets were on sale and the inevitable collecting boxes were filled beyond expectation. Several new members were welcomed into the society. The ceremonial party and guests assembled on board and were given a tour of the ship by Andrew Summerell before the main event. Afterwards, members of the Medway Queen Preservation Society and the public were allowed on board to admire the work done so far and to appreciate how much remains to be done. The hull rebuild and the establishment of the society’s apprentice training workshops on Gillingham Pier have been supported by a grant from the Heritage Lottery Fund and funding from the European Regional Development Fund via the INTERREG IVA 2 Seas Programme. The ceremony marked the end of this major phase of the ship’s restoration and the beginning of the refit to working order. 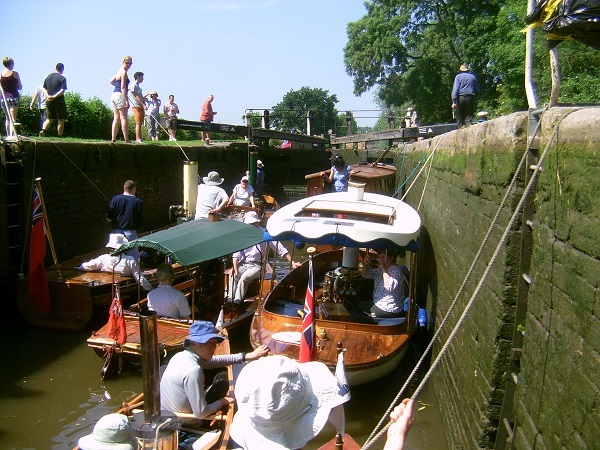 The timescale in which this refit can be achieved is entirely dependent on the success of the society’s fund raising and to that end grants, sponsorship and individual donations are all being sought. The priority areas are the upper aft saloon as a dining space and the engine room as a visitor attraction and the central part of any working vessel. A new boiler will be required for which the society does not yet have funding. Any offers of help in cash or in kind would be welcomed at the Medway Queen Project Office, Gillingham Pier, Gillingham. ME7 1RX. The ship will not be leaving the dry dock immediately. There is more work to be done in preparation for the tow and then the tug has to be available and the weather outlook acceptable. When these conditions are all met the ship will be moved without further ceremony. Predicting exactly when this will happen is not possible but the details will be posted on www.medwayqueen.co.uk as they become clear. It is intended that the ship’s arrival in Gillingham will also be marked in a suitable way but notice for this will be very short. The fitting out phase will then commence in earnest. Further events celebrating the tow home include a Music Festival on 7th September and the society’s Gillingham Pier workshops will be open to society members and to the public on all 4 days of the Heritage Open Days weekend of 12-15 September. Details of both events will be posted on their website. All photo's by Richard Abels. This years Midlands Model Engineering Exhibition is running from Thursday 17th October to Sunday 20th October. Philip Martino is organising the SBA's presence and would like help manning the stand. He is also looking for a smallish boiler for the display. If you can help please contact Philip using the contact details in the members register. More information of the exhibition itself can be found on their website. 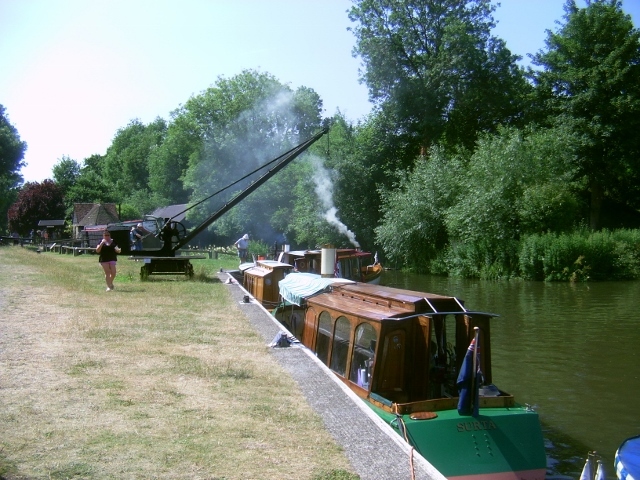 18 boats, including two new boats (Anna Jayne and Curlew III) took part in a rally hosted by the National Trust at Dapdune Wharf on the River Wey in Guildford. 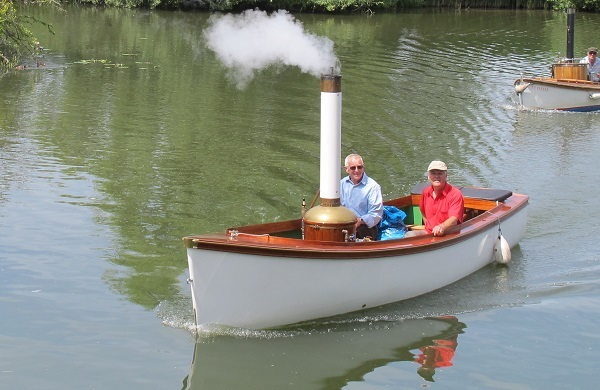 On the Saturday many boats were used to instruct members of the public in how steamboats work and provide rides. After this there was an evening cruise with the National Trust Staff and Volunteers followed by a meal. On the Sunday many boats cruised upstream for lunch before returning to pull out. Many thanks to the National Trust staff at Dapdune Wharf who helped organise and promote the event as well as offering us such a warm welcome and use of their site. More photo's of the event are now available on the photo album page and a video is available below and in the video gallery. The first completed SYLVIE class launch, as featured in FUNNEL 157 pg.22 and 78, has now been successfully launched. Four others are under construction, one being professionally fitted out as a hull ready for plant to be fitted ( steam, electric or IC) and will be available very shortly. Further details and specifications for this hull are available from Richard Havard (see Funnel or members directory for contact details). It is with sadness that we pass on the news that David Harding died on the 14th of July, he will be missed by his many friends in the SBA. David was an active member of the Steamboat Association since it was formed in 1971 and attended many rallies with his boat Mudlark. The funeral will be at the Sutton Coldfield Crematorium on Monday 29th July at 2:00pm, and afterwards from about 3:00pm at the Moor Hall Hotel (just round the corner). Would anyone wishing to attend please let Trefor Milns know as soon as possible for catering purposes (contact details in members directory). You are invited to the unmarked graveside memorial service for those who lost their lives in the Lorena tragedy at Brightlingsea 110 years ago, which will be led by Rev Ann Howson. On the night of 8th August 1903, 9 crew members returning to the steam turbine yacht Lorena were rowed by 2 Brightlingsea men from the Hard out into the Colne where it was anchored. Conditions became rougher away from the sheltered Creek, and there were twice as many crowded in the dingy as should have been. 400 yards from the Lorena one stood up crying out they were sinking as water swamped the small boat. The then current Deputy Mr W Miall Green, was aboard Yoland, another yacht moored nearby, and he took command of the immediate rescue by sending off the Yoland’s cutter towards the sound of the men’s cries. He then followed in his steam launch. Between them they managed to rescue 2 men, one from Brightlingsea & one of Lorena’s crew. (The Daily Mail two days later mentioned Miall Green as picking up the ferryman & stoker himself). Unfortunately the others could not be found. The next morning 5 bodies were found, then in the afternoon 2 bodies were found on St Osyth shore, one was Brightlingsea man Joseph Lock. Next day another was found, then after a week the last body was found on Cindery Island. The 8 men of the Lorena were put in one grave together, and immediately alongside Joseph Lock was buried, but no memorial was put up, and up to now, on the 110th anniversary of the tragedy it remains unmarked in the churchyard. Consequently few know of the loss of these mariners on one night at Brightlingsea, so to commemorate them and recall the quick actions of a past Deputy that saved two men’s lives, please take part in the short open air memorial service. 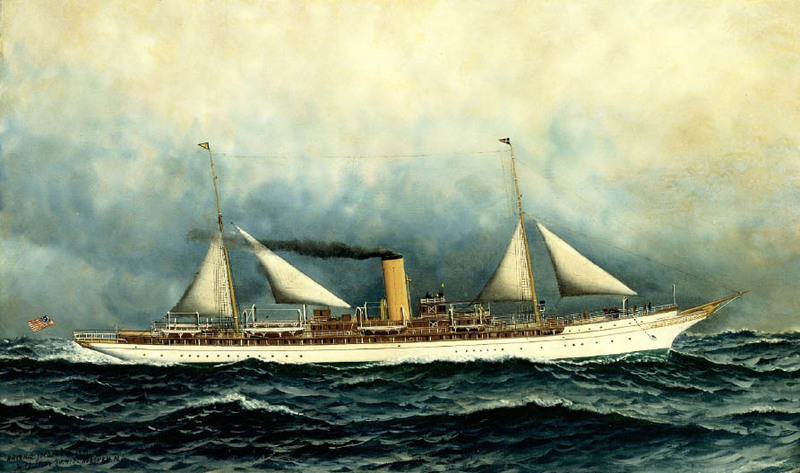 Lorena was a large yacht (more information here), figures are published for 269 & 300 feet long, and was the fastest and to be the most luxurious steam turbine yacht to have been built at that time. She had been built in Leith and was undergoing sea trials before her final fit, her crew had boarded at Leith. She was in Brightlingsea to refuel with coal. 7 of the 8 drowned men of the Lorena are believed to have been stokers, so would have been working hard both during the speed & time trials where they achieved a cruising speed of 18 knots, and during the coal loading. The Brightlingsea man Joseph Lock who helped to row, was by profession a bricklayer, but had been assisting the coal loading of the yacht. He left a widow & 4 children. 15 boats took part in a very enjoyable and very sunny rally on the river Trent last weekend. On the Saturday boats cruised down the Soar stopping for lunch at Normanton. On the Sunday the cruise took boats up the Trent and on to the Trent & Mersey Canal to Shardlow for lunch, followed by a stop off on the way back at an SBA member's garden railway. album page and a video is available below and in the video gallery. Boats attending: Chantilly, Heron, Lady Selsey, Meteorite, Myth of Malham, Nokomis, Orinda, Petagin, Phaeton, Primrose, Roundtuit, Senta, Taniwha, Tern, Ursula. If you have photos or video's of recent steamboat events why not email the webmaster with the details so that they can be shared on the website? The hull of PS Medway Queen is nearing completion in the Albion Dockyard, Bristol. The yard has built the first fully riveted hull to be constructed in the UK for over 50 years and this phase of the restoration is now drawing to a close. The rebuild was supported by a grant from the Heritage Lottery Fund. To mark the end of this phase of the project a re-dedication ceremony will be held at the dockyard on Saturday 27th July. This represents an eagerly awaited milestone in the restoration and it is also a significant event for engineering in the UK. The Albion Dockyard (Hanover Place, Bristol BS1 6UT) is not far from the SS Great Britain, and will be open to the public from 12 noon on Saturday 27th July until approximately 5pm, admission free. A short re-dedication ceremony will be performed at approximately 2pm. After the usual speeches Evelyn, Emelia, and Elizabeth, daughters of Andrew Summerell (MD Albion Dockyard Ltd.), will re-dedicate the ship. 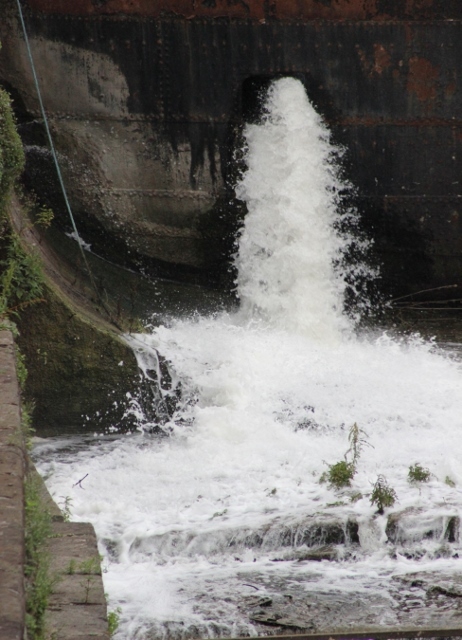 The sluices will then be opened and flooding up of the dock will commence. This is a lengthy process and it is unlikely that the dock will be completely filled in the course of the afternoon. 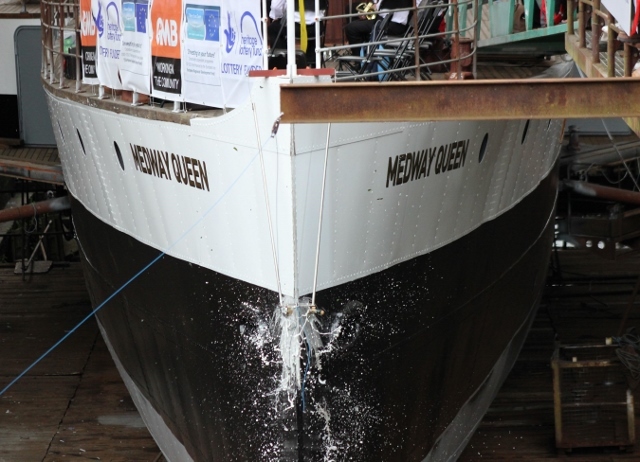 After the dedication it is hoped that members of the Medway Queen Preservation Society will be able to tour those parts of the ship that are safely accessible. All of these arrangements are subject to operational conditions at the yard remaining favourable of course. 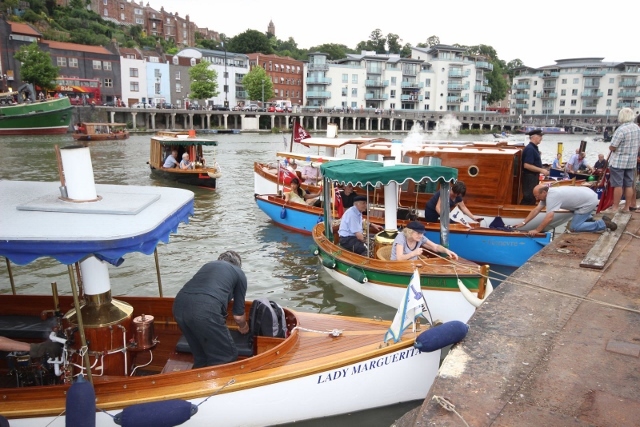 The weekend of the 27/28th July is also the Bristol Harbour Festival weekend, with a huge variety of interest and entertainment just a few minutes walk from the dockyard. Even more reason for coming to Bristol and wishing Medway Queen well. The ship will not be leaving the dry dock immediately. There is more work to be done in preparation for the tow and then the tug has to be available and the weather outlook acceptable. When these conditions are all met the ship will be moved without further ceremony. Predicting exactly when this will happen is not possible but the MQPS website (www.medwayqueen.co.uk) has a page dedicated to the “tow home” and details will be posted there as they become clear. It is intended that the ship’s arrival in Gillingham will also be marked in a suitable way but notice for this will be very short. The fitting out phase, supported by the EU Interreg IVA program under the "Heroes of the Two Seas" project, will then commence in earnest. As another of the series of events centred on the tow home the society’s Gillingham Pier workshops will be open to society members and to the public on all 4 days of the Heritage Open Days weekend of 12-15 September. The summer edition of "The Funnel" magazine has been landing on the door mats of SBA members recently. This edition includes a wide variety of articles including information on historic steamboats, technical articles and members reports of their boat building projects - one of which is available for non-members to download to get a taste of what the magazine is like. If you like what you read why not join the SBA? 29th/30th Nov/1st Dec and not as listed in the latest FUNNEL. These dates may be extended before and after the weekend at the same special rate at the Abbey Hotel. Please note that extra days need to be booked and paid for by members directly with the hotel. Members who have already shown interest will be contacted during August and a non returnable deposit will be requested at that time. There are still a few rooms available, if you are interested please contact Richard Havard as soon as possible.